Order in next 3 hours and 54 minutes for despatch today. Decoratively Stitched replacement zip tag for handbags.. 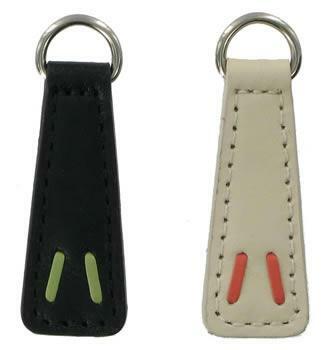 This leather replacement zip tag is decorated with large stitches of thonging in contrasting shades. It comes with a nickel split dee ring and is edged in the matching shade to the main part of the tag. The leather portion of this tag measures 5cm in length. The tag is available in 3 colourways; cream with coral stitching, plum with pale pink stitching or black with pistachio stitching( BLACK NOW SOLD OUT ). Make your choice of colourway from the pull down menu below. To fit this zip tag you will need a pair of needle nosed pliers, firstly to open up the dee ring and then to pinch it closed.